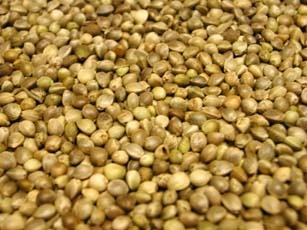 Hemp Seed is one of the best all-round Particle fishing baits. It can be used on its own or in a groundbait to form a carpet of bait. Hemp can also be used as a hook bait for catching smaller fish. Directions: Tip the dry hemp into a container with a lid, cover with cold water and seal the lid. Leave over night. They will swell up slightly at this stage so make sure your container has sufficient room. Now move the hemp and water into a pan and bring to the boil. When boiling, reduce heat and simmer for about 15 minutes. If you would prefer, use a pressure cooker, this has the advantage of retaining more of the natural smells. Keep an eye on the bait, ensure it is softening but not breaking up.